Dentures are prosthetic teeth that are affixed into a base that looks like the gum tissue. Conventional dentures secured by natural suction have long been used as a solution for significant tooth loss, but can also slip or slide around and may even fall out when you’re trying to eat your favorite meal. Implant-retained dentures offer a better option. 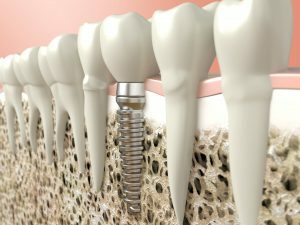 Dental implants are titanium posts that take the place of a missing tooth’s root. When implanted directly beneath the gum line, the implant posts promote the growth of bone tissue and gradually fuse together with the jaw. In this way, multiple implants can create a sturdy foundation for a complete denture. There are two main options for implant-retained dentures: traditional implants, which are placed and restored over the course of about a year. This option can support a fixed or removable complete prosthetic. Same-day implant-supported dentures are also possible with the All-on-4 method. This option uses 4 dental implants to support a complete, fixed prosthetic in the upper or lower jaw over the course of a single day. If you are eligible for complete tooth replacement with dental implants, you and your dentist will discuss your options to determine whether conventional implants or All-on-4 dental implants are best for your smile during an initial consultation. If you are missing all of your teeth, don’t give up hope on finding a secure tooth replacement option. Implant-supported dentures may offer the help you need! Schedule an appointment with your restorative dentist to discuss your options for regaining a complete smile ASAP. The Silver Creek Dentistry team offers comprehensive general, restorative, and cosmetic dentistry services from the comfort of a state-of-the-art office. With multiple implant experts on staff, patients can find full-service dental implant dentistry services in one convenient location. To learn more about dental implants, schedule an appointment with their office by calling 920-748-7200.